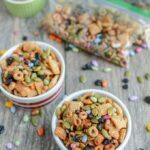 This nut-free Toddler-Friendly Trail Mix is the perfect make-ahead snack. Make a batch during your food prep session and portion into bags for kids to eat throughout the week. Put cereals and pumpkin seeds in a large, microwave-safe bowl. Pour butter in and stir well to coat. Sprinkle in cinnamon (and sugar if using) while stirring. Microwave an additional 90 seconds. When cool, add dried blueberries and sunflower seeds. Portion into bags and enjoy for a snack! Remember that the butter/cinnamon mixture is often. Feel free to just combine cereals, seeds and blueberries and enjoy. Customize with your favorite cereals!